In the movies, everyone always roots for the good guys. The clean-shaven hero with the shiny silver badge, riding in on his horse to save the day…it’s a scene that we’ve all seen hundreds of times. But what about the villain? The one with the sinister laugh, or the crooked scar, that is an evil genius. Nobody ever cheers for the bad guy…at least nobody did until now. Norman Bates Dress Like Your Mom Race – Competitors will have to thrown on a mop top, house coat, and compete a race around the bases. Hannibal Lecter Obsticle Course – Eat some fava beans and a nice chianti, put the lotion in the basket, and race like your life depends on it. Why So Serious? – Joker face painting on the concourse. Annie Wilkes Escape “Misery” - We promise that no ankles will be broken in the making of this competition. Name That Sound – is it Darth Vader breathing or someone else snoring? Cobra Kai Sweep the Leg Contest…You got a problem with that? 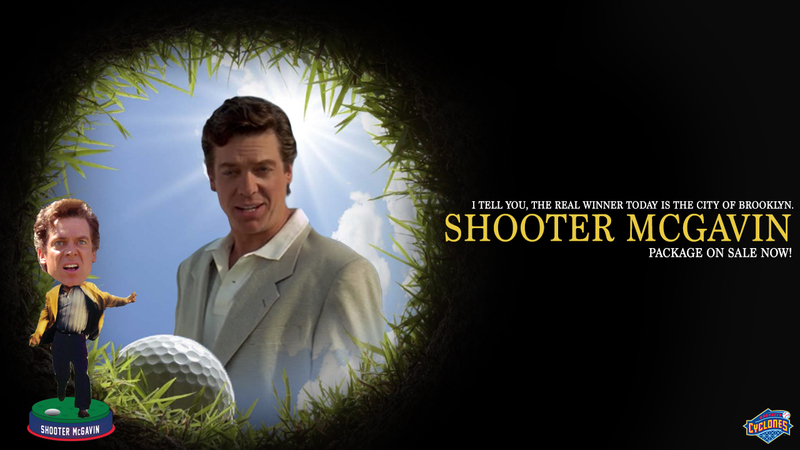 Shooter McGavin’s Breakfast of Champions – No it won’t be actual pieces of $&%#. Contestants will have to chow down on bowls filled with Cocoa Puffs. And that’s just the beginning. We’ll be adding more details, as the event gets closer. Single game tickets for the 2017 season will be available on Saturday, April 22nd at 10 AM. Group tickets, partial season and full season packages are available now by calling 718-37-BKLYN.